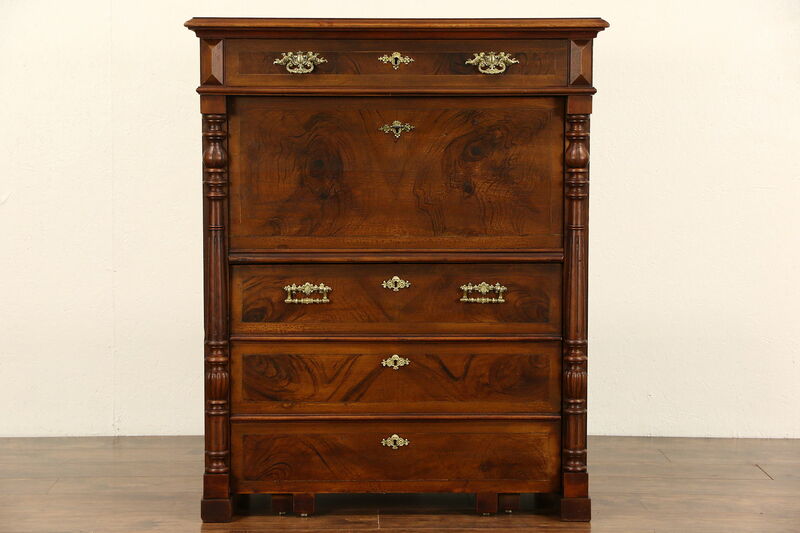 Hand crafted in Austria about 1880, this unusual chest has a pull out telescoping baby bed in the base. Cast brass hardware with angels and lion faces with keyhole mouths is original on this European furniture. Original artistic burl grain painting has some wear and losses for a little antique character, and has been preserved with clear satin varnish. Drawers have hand cut dovetail joints. When opened, the baby bed could be used for linen storage as well, interior size is 27" wide, 51" deep and 19" high. Overall size is 38 1/2" wide, 23" deep and 47" tall.